An often asked question is: What is the optimum velocity for penetrating RHA plates? The optimum velocity is dependent on the penetrator density and the target hardness only. In case of steel penetrators the hardness of the penetrator has influence on the optimum velocity too. If you are interested in the derivation of the equations please "click here". Tungsten, DU and Steel penetrators feature very different optimum velocities. 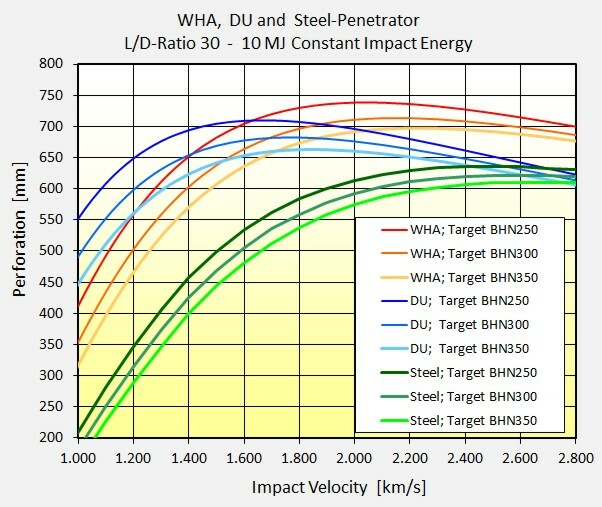 The following graphic illustrate for an impact energy of 10 MJ the perforation performance for targets with different hardness (BHN 250, 300 and 350). The penetrators are supposed as cylinders with an aspect ratio of 30. Tungsten and steel have optimums beyond 2 km/s which are out of the feasibility with conventional guns. But take in account that the presented optimum velocities have purely academic character only. One has to consider the whole ammunition/gun system how it is described under "Max. Perforation with a given Gun System".